The 19th September marks the 150th anniversary of the birth of Arthur Rackham, one of the leading illustrators during the “Golden Age of Illustration”. 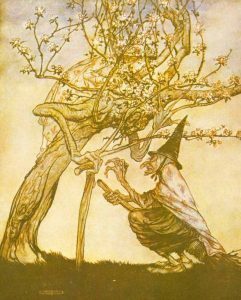 Rackham was renowned for his portrayals of fairies, ghosts, goblins and witches. His depictions of trees were also particularly distinctive – they often contained faces, twisted branches, grasping roots and other anthropomorphic qualities. Rackham’s first major success was his work for Grimm’s Fairy Tales in 1900. In Peter Pan in Kensington Gardens, which was published in 1906, we can see that Rackham was greatly influenced by the Pre-Raphaelites and also by Japanese prints. 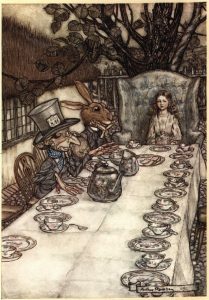 In Alice in Wonderland, Rackham played up the grotesqueness of the characters and his illustrations for this book were highly revered, after Tenniel’s of course. Rackham also illustrated Aesop’s Fables, A Midsummer Night’s Dream, Puck of Pook’s Hill, Rip Van Winkle, The Wind in the Willows, to name just a few. Rackham’s illustrations can also be seen on the surlalune fairytale website or pop into the Curriculum Centre to see some printed versions of his illustrations. Posted on September 18, 2017 by Laura Brett. This entry was posted in Focus on folklore and tagged Folklore, Illustrators, Traditional Tales. Bookmark the permalink. Rackham’s work is fascinating, thank you for this!